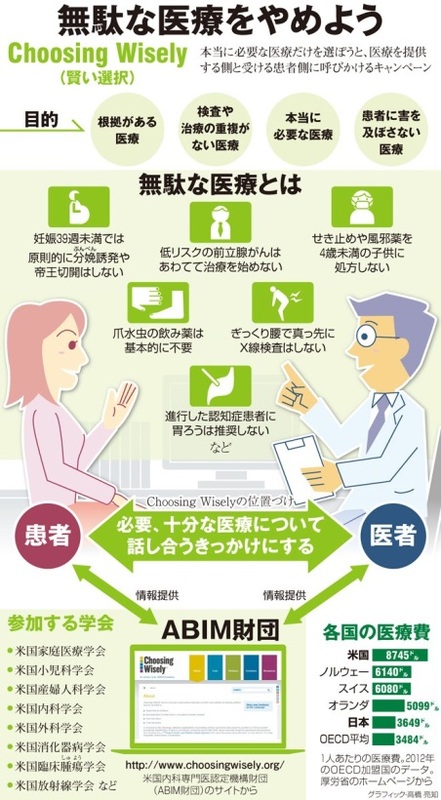 Image from an article on Choosing Wisely in the Japanese publication The Asahi Shimbun. The simple premise of the Choosing Wisely® campaign –facilitating conversations between clinicians and patients about appropriate care and overuse – has now spread globally and inspired nearly a dozen countries to develop initiatives of their own based on these ideals. Choosing Wisely’s influence can now be found in Australia, Canada, England, Germany, Italy, Japan, the Netherlands, New Zealand and Wales. While some of these programs are just getting underway, others have already begun to make an impact. Similar to the response to the campaign here in the U.S., these international efforts have also been embraced by clinicians and the public. On April 2, 2014 – almost exactly two years after the ABIM Foundation launched Choosing Wisely in the United States – “Choosing Wisely Canada” released 40 recommendations from nine Canadian specialty societies. Led by former ABIM Foundation Trustee Wendy Levinson, MD, the campaign has since grown to more than 100 recommendations and recently announced a new book, Focus on Choosing Wisely Canada, through the Canadian Medical Association Journal. Choosing Wisely Japan has produced its first set of five recommendations, and in January 2015, held a joint conference with South Korean representatives to collaborate research efforts aimed at enhancing public health in both countries.